There is no greater gift of knowledge than passing on a better understanding of the natural world in which we live. In a culture that is remiss in its duties to train students in natural science, environmental education is paramount to our survival as a species. Within increasing global climate shifts, a basic understanding of how the natural world works is more critical now than ever before. EMC believes in direct, experiential learning that allows students to develop and apply critical skills thinking to challenge environmental problems. Whether it’s calculating snowpack run-off, monitoring streams for biological health, or sampling wildlife populations, Dr. Rick Van de Poll has provided time tested field leadership among students of all ages. Teaches between 15 and 20 adult education workshops throughout the Northeast per year. 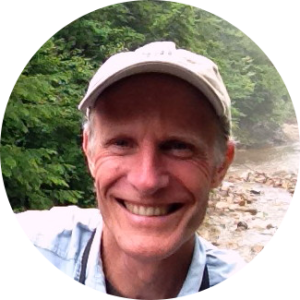 Dr. Rick Van de Poll provides quality inventories, assessments, and knowledge of our natural resources to promote biodiversity conservation in New England for the public and private sector. In 1985 he founded Ecological Management Consultants of New England, LLC and since then has inventoried over 350,000 acres. Dr. Van de Poll sets the standard with his innovative contributions to the environmental field and was the first to complete a PhD program in Natural Resource Inventory in the Northeast. Rick is highly influential with State and Federal agencies and his unparalleled expertise is sought after throughout New England and New York. He has appeared on TV, radio and as a keynote speaker on various ecological topics.